No Fenders -Formula 1, IndyCar and A Whole lot more..: Psst, have Y'all heard 'bout Ronnie Howard's 'lil racing movie? Psst, have Y'all heard 'bout Ronnie Howard's 'lil racing movie? And I've known about "Niki-the-Rat" since beginning my Formula 1 indoctrination circa 1986, albeit Niki had already left the pinnacle 'O motorsports, having decided to retire for good upon the completion of the 1985 season, which he'd spent frustratingly defending as the reigning world champion vs. upstart McLaren teammate "The Professor," aka Alain Prost. 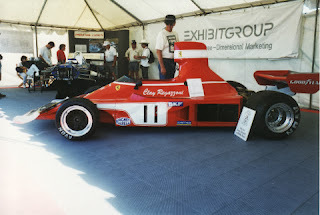 As it's funny how I've felt that Niki is a pompous ARSE for a number of years now, I suppose ever since he sent Jaguar F1 into its inevitable tailspin, as say what Yuhs want to 'bout "Booby Ruble," (Bobby Rahal) but; he was pretty spot-on in his failed attempt to spirit away Adrian Newey, eh? 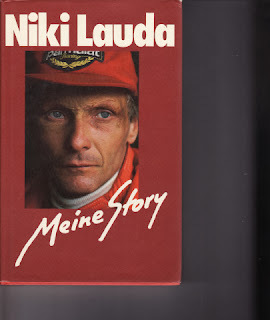 Yet you can't say alls bad towards Lauda, I mean after all he did win the world championship twice for la Scuderia... As I've even seen a few of his ex-Formula 1 rides in action at both Monterey and Sonoma's "Hysterical's," nee Historics over the years... Hmm? might even try pulling out a long, lost photograph I'd taken of his No. 11 racecar, I believe?